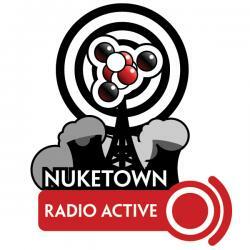 Radio Active #26 offers a well-rounded podcast, with some updates on the ongoing “Nuketown Beta” project, followed by an editorial on the sorry state of science fiction publishing, particularly with regards to using technology to promote their wares. There are also three sites of note, including the podcast Most People Are DJs, the Cthulhu-inspired LEGO layout Cthulego, and the game mastery blog Treasure Tables. Finally, there’s a review of the classic science fiction novel Rendezvous with Rama. Back to GarageBand Used GarageBand 3 to record this; let me know what you think of the quality. Biweekly Schedule: Formally going to go to a biweekly schedule, publishing on Mondays. Radio Active Promo: The first ever-radio active promo is available for download. Share and enjoy! Why are SF publishers behind the ball? Visit TOR’s Web site: No e-mail newsletter, no RSS feed, current news item from 2005 … second last from 2004! Spectra has an email newsletter, but no RSS. Oh, and the script to subscribe fails in Safari. Del Rey – email, no RSS. Sample chapters are available however. Analog has online subscriptions (yeah) but no online newsletter, no RSS, and only a smattering of content available on the Web. RSS Feeds: At the very least, give me a feed for new releases and reprints. If you’ve got news, add it. Email Newsletters: Everyone should have one, published at least monthly (biweekly if you can manage it). And it should work in all browsers. News must always be current. If you don’t have any current news, make some — give me interviews with authors, editors, etc. Can’t pay someone? Get an intern. Do a podcast/publish a zine: Print is dead. Liven it up by sponsoring a Webzine or producing a podcast. Even quarterly would be worth it. A few sites get it close to right. Locus Magazine’s web site has a RSS feed and an editorial blog. SCIFI.com has a podcast (albiet a difficult to find podcast). Most People Are DJs: (Web Archive) Music and geekiness. A variety of alternative, techno and punk bands, plus the occasional reviews of comic books and other geekiness, as well as a certain obsession with the O.C. Treasure Tables: (Web Archive): Excellent blog for GMs or anyone trying to understand them. Active forum, frequent posts discussing theories of GMing and links to tools. In the not-to-distant future, Paris is destroyed by an asteroid. This prompts the formation of Spaceguard international agency designed to identify and intercept Earth-crossing asteroids and comets. Then they discover a particularly large, cylindrical object approaching the solar system at an incredible rate. Dispatch a ship to investigate, and what they find is a mystery wrapped in an enigma. Inside the spinning world is a cylindrical artificial world, one in which the land (and a huge “Cylindical Sea” hangs overhead). As the ship nears the sun, it comes alive, revealing “biots”, biological robots that begin conducting repairs and carrying out all manner of unknown tasks. The crew quickly explores the ship, dealing with its evolving environment (including huge storms as the sea melts) and trying to figure out who the Ramans are … and why they were obsessed with threes. Great, hard science adventure, one who’s characters don’t have a lot of depth of complexity, but who are explorers through and through. Subsequent books tried to add that “human” angle by including flaws and such, but never even came close to the original. Intro music is “Groove It” by Denis Kitchen, found via Podshow Music.